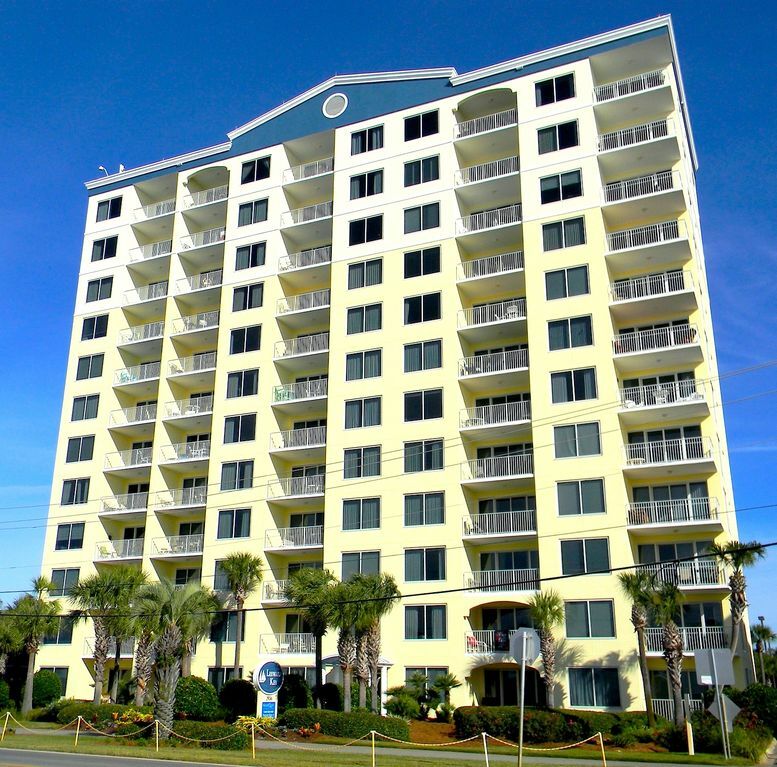 2-bedroom luxury condominium with a stunning ocean view, located in Leeward Key, Miramar Beach, Destin, FL. Situated in the 12 story Leeward Key tower, this condominium offers a high end luxury suite complimented by a direct view of the ocean. Go out onto the balcony and enjoy sunrise to sunset views of the Emerald Coast. Enjoy the gentle sea breezes from a 10th floor view vantage point. The suite has a king bed in the master bedroom and a queen bed and twin bed in the 2nd bedroom, along with private baths with jetted tubs. The condo has a fully furnished kitchen and high-speed internet service. The living room offers a pull-out sofa with flat screen TV and entertainment center. The living room flows out of the dining area that is furnished with a dining table and chairs with additional seating at the bar. The condo offers comfortable living with a great view. From the balcony all you see is ocean! Leeward Key: Leeward Key is a condominium complex on Old Scenic Hwy. in the Miramar Beach area of Destin, Fl. It is a 12 story complex featuring a spacious parking lot for free parking. There is a rear pool complete with grills to make a perfect family gathering opportunity. The complex also features an ocean front pool that is heated in the cooler months. Leeward Key has an exercise room and movie rental/vending room. The spacious front office area includes meeting rooms available for group meetings or activities. The front office has computers with printer access. Security and amenities: The entry to Condo 1002 is secured by a keyless entry system. You, as our guest, are provided with a key code to your room. The fitness room and pools are easily accessible by scanning your security bracelet. From March through October we provide complimentary beach service (one umbrella and 2 chairs) for guests in our unit. About OceanView: OceanView is our signature title for three condominiums located at Leeward Key. We have two 2-bedroom units and one 4-bedroom unit available in the building. Fitness room located on first floor for exclusive use of Leeward Key guests. Spacious 2 bdrm condo, wonderful view! We had a wonderful time in this beautiful condo! It was perfect for our family vacation. We love staying at Leeward Key as it has so many amenities. We love the two pools, especially the one overlooking the beach and the fact that Kenny D's grill is next door. So convenient and perfect for teenagers! This was our first time staying in this particular condo at Leeward Key and it has been our favorite! We will definitely stay here again. We loved being in this corner unit as the master bedroom has spectacular views. The blue chair was a great spot to curl up with a book! The beds were very comfortable and the decor was very nice. The kitchen was well equipped and we had everything we needed. I would highly recommend this Condo!!! Thanks for letting us know how much you enjoyed your stay! We're so glad our unit was a great fit for you and your family. Please do contact us when you return to Destin...we'd love to arrange another vacation for you! We had a wonderful stay at 1002 at Leeward Key. We've stayed at Leeward Key several times and this was the nicest condo we've stayed in! We loved the corner, beautifully decorated condo with a stunning view. All of the amenities were fantastic. The chairs and umbrella as well as the heated pool made it much easier with our toddler. We will definitely be back! This condo was exactly what we were looking for during our stay in Destin. We had a large party with numerous kids, and its proximity to the beach and two pools made it convenient for everyone's different schedules. The actual condo was spacious, clean, and had GREAT amenities-- flat screen TVs, wireless internet, kitchen utensils, and enough comfy furniture for everyone! We were always excited to curl up with a movie or some games at the end of a spectacular day on the beach. I've stayed in many condos here in the Destin area and around the U.S., and this is definitely one of the best. I'll be recommending it again and again. 30% payment due at the time of booking, with the remainder due 30 days in advance of your stay.